"2011...what a year! A year of social unrest, demonstrations, riots, government overthrows, mass murders, earthquakes, tsunamis, floods, nuclear reactor meltdowns, political discord, economic distress (the "R" word has resurfaced), austerity, financial weakness, credit rating downgrades, volatility, financial fraud, law suits, assassinations, and the passing of Steve Jobs...no wonder the markets have been so reactive (sometimes quite violently) rather than proactive in a measured manner." "The question will be whether stability returns to the European markets and whether recent stability can hold and improve in Emerging Markets for 2012, or whether volatility (VIX) will rise again...the VIX is still elevated, so there is a good possibility that it will. No doubt, all market action will be reflective of upcoming world news events, as well as consumer and investor sentiment, together with risk vs safety appetite. A couple of gauges that I'll follow in this regard are the VIX, U.S. $, and Copper, as well as the other instruments noted above. Without benefit of major Fed QE intervention, I imagine that next year could be range-bound...within this year's high and low, generally...although unforeseen catastrophes could send the Major Indices below this year's lows." 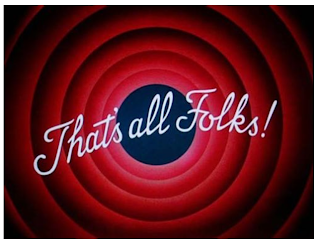 2012 has been slightly quieter -- just remove the words "nuclear reactor meltdowns, and the passing of Steve Jobs," but repeat the rest. Add to the mix the fact that (a) Central Banks around the world have poured huge amounts of monetary stimulus into the markets, (b) there have been a variety of government elections around the world, and (c) the markets have gone through a Presidential/Congressional election in the U.S. and have faced turmoil related to the "Fiscal Cliff" and "Debt Ceiling Limit" issues -- and you get the following results on the U.S. Major Indices. 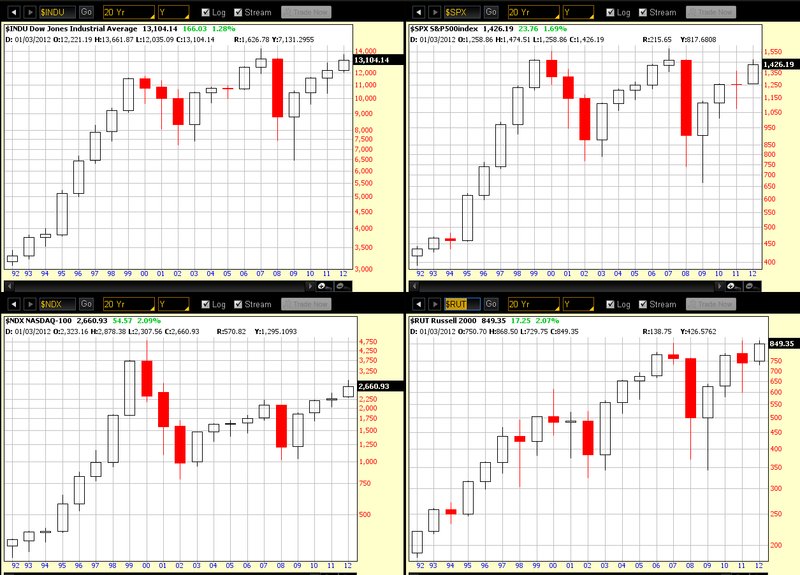 Each candle on the following charts of the Major Indices represents a 1-Year period. 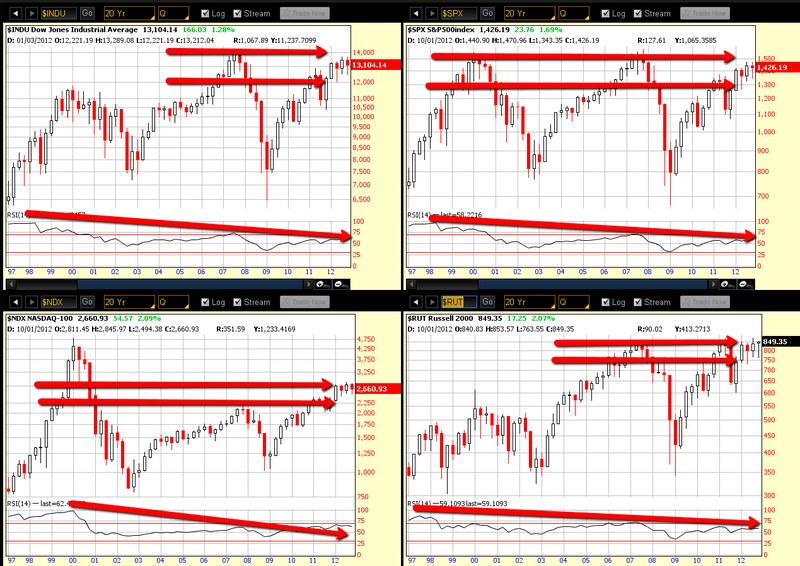 You can see that 2012 closed modestly higher than 2011, but is facing all-time major resistance. 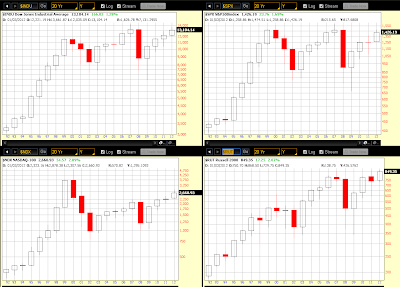 Each candle on the following charts of the Major Indices represents One Quarter. While Q1 of 2012 made a promising start, the next three quarters really didn't progress any higher. Instead, they chopped around inside this range and closed near the high of Q1 on negatively diverging RSI on the Dow 30, S&P 500, and Russell 2000 Indices, while the Nasdaq 100 Index closed a bit below on falling RSI. The Q4 candle ended the year as a bearish "hanging man." 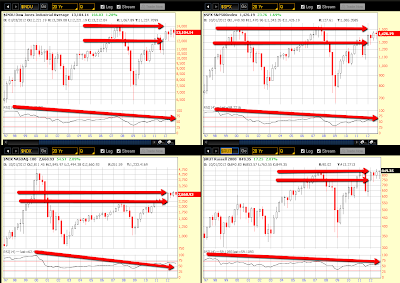 The RSI and "hanging man" issues are signalling caution here for the bull case. These markets will need to break out and hold above 14000 on the Dow 30, 1500 on the S&P 500, 3000 on the Nasdaq 100, and 900 on the Russell 2000 Index in order to, potentially, attract serious buyers to sustain and produce significant gains for 2013. A failure to do so, will likely keep them range-bound in 2012's range, or send them lower. 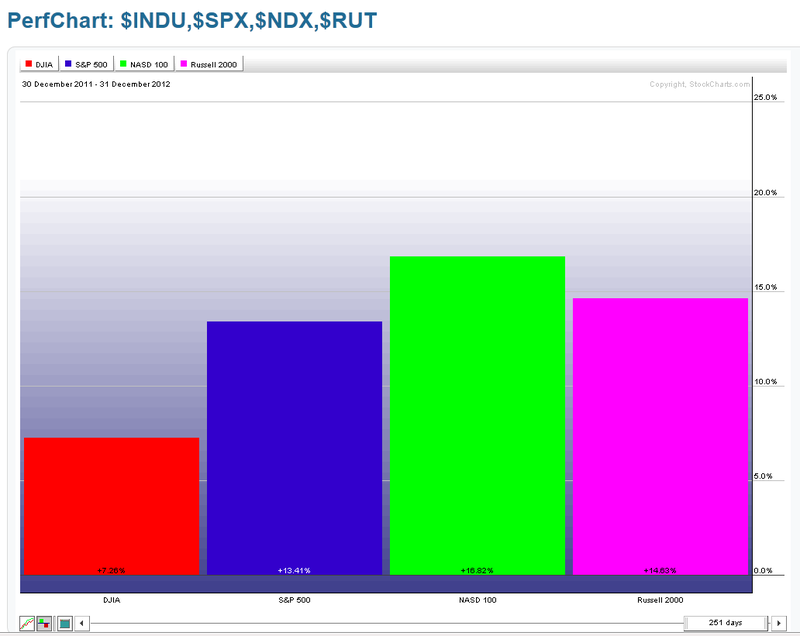 The following graphs show percentage gained/lost on the Major Indices for 2012. The Nasdaq 100 made the most gains, while the Dow 30 made the least. We'll see whether or not buying picks up in the blue-chip stocks, or whether the markets continue to favour the more risk-oriented stocks in the Nasdaq 100 and Russell 2000 Indices. The latest Consumer Confidence numbers show that, while they were slightly higher in 2012 than 2011, they have plateaued (and dropped lower this past month) and are still well below those experienced from 2000 to 2007 (less than half). It's one to watch over the coming months for signs of either increasing weakness, or renewed strength, and by how much, inasmuch as such data may have an impact on the markets -- as you can see from the index charts above, the consumer confidence graph for 2012 is similar to those markets. In summary, without the added monetary stimulus from the Fed, the U.S. markets would have likely pulled back considerably this year due to the lack of a cohesive fiscal governance of economic policies and programs. Whether we see any strengthening of bi-partisan ties that produces creative growth policies and programs to provide sufficient consumer, business, institutional, and domestic and foreign investor confidence remains to be seen. 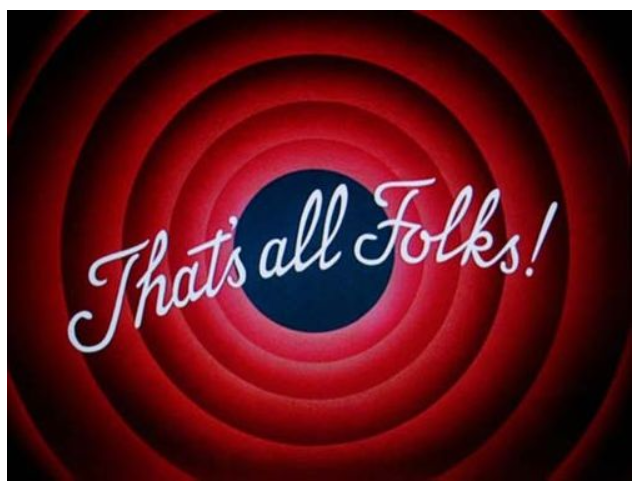 If we don't, then I think we'll see a repeat of choppy, non-directional, and volatile, low-volume market action with unsustainable follow-through in 2013 -- a market that is continued to be ruled by news headlines and Central Bankers, rather than one that is based on sound economic conditions and individual company fundamentals. If the in-fighting that we've witnessed in the "Debt Ceiling Limit" debate and "Fiscal Cliff" discussions are any indication (both of which are still unresolved as at Monday's market close), I think they are a snapshot of what is to come for 2013 and, likely, until the next Presidential/Congressional election -- there seems to be a growing bitter divide between parties, and even among members in the same (Republican) party. Therefore, I think the latter scenario will dominate market action for the next four years, particularly since these markets are at all-time major resistance...I hope I'm wrong, since I'd like to see everyone do well. As I mentioned in my post of December 28th, I'll be watching the Index/Volatility Ratio Charts, 30-Year Bonds, the U.S. $, and the "Fed Monetary Stimulus Program Canaries" to gauge short-term market sentiment for equities. ***Thank you for your kind support this year. Happy New Year 2013! I wish each and everyone much peace, prosperity, good health, and happiness!